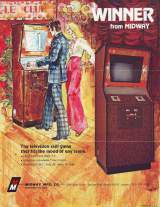 Arcade Video Game published 46 years ago by Midway Mfg. A Table Tennis game. Players hit a ball back and forth across the screen using their paddles. Failing to return the ball awards a point to the other player. Released in April 1973. This "Pong" clone was Midway's first video game. Midway was reportedly one of only three companies to pay licensing fees to Atari for the game. Around 10,000 units were produced.